A copy of AlterKnits was sent to me for free from Interweave, but all opinions are my own. Andrea Rangel is a prolific designer known for her colorwork and rustic, wearable patterns--the kind of designs meant to be loved and worked in, not stored away for fear of ruining. She also happens to be one of my friends in the industry, and I loved her first book Rugged Knits, which was strictly a pattern book. Andrea's second book, AlterKnit Stitch Dictionary, captures her love of colorwork with 200 original and fresh knitting motifs. Fun fact: Andrea's husband Sean (who is an artist) drew all the motifs in the book! I think this creative input from someone outside the industry is what has helped make this book so unique, since I assume Sean wasn't bogged down with years of traditional knitting motifs in his head. Andrea notes in the introduction of the book that Sean knows how to knit, but doesn't practice it much so he doesn't "think like a knitter." 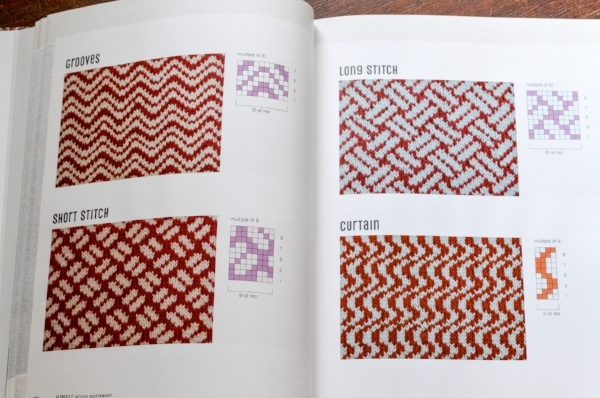 Like most Interweave books, the first 22 pages are devoted to basic colorwork theory, from choosing colors to different stranding techniques. As a seasoned knitter I personally hate how every knitting book has to include this background knowledge, but I get it. At least with AlterKnit, it doesn't take up too much space and you can quickly move onto the best part--the stitch patterns! The motifs aren't divided into categories or chapters. On one hand, this is nice because it encourages browsing, but on the other, as a designer it would be more helpful to have the motifs divided by style (geometric, nature inspired) or by stitch repeat size (12 st rep, 20 st rep). The swatches are clearly photographed and of a generous size, and the color combinations Andrea chose are so...Andrea! Take a look at some spreads from the book below to get a feel for the layout, color schemes, and scope of the designs. 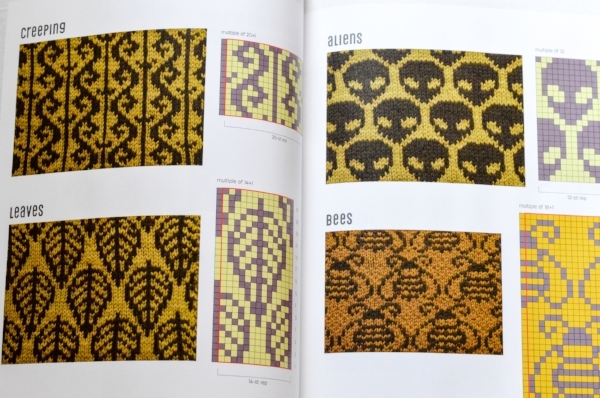 The book also includes several designs and tips on how to replace the motifs used with other motifs in the book. This is a great touch and a smart way to make the included designs go further, as knitters can knit multiple versions using different motifs! Andrea has said designers are free to use the motifs in their designs, and I'm already using one in an upcoming sweater worked in Blue Moon Fiber Arts Cake DK. You are a designer who loves colorwork. You are a knitter comfortable with modifying patterns who loves colorwork. You fall into either category above and especially love modern and quirky motifs. If you prefer to knit patterns as-is and don't like substituting stitch patterns or figuring out math, I don't think this book will have much value to you as a knitter unless you happen to love all the patterns as they are. If you are comfortable with modifications or designing your own patterns, AlterKnit Stitch Dictionary is a fantastic resource for the colorwork lover.